We will never reach our full potential without good character,” said Paul Weaver, Founder of Lodestar Guidance. “That is why I am so passionate about helping people adopt these character principles. Paul Weaver, CEO of Weaver Leather, has launched Lodestar Guidance, a comprehensive video–based leadership program founded on 48 character principles. The program is geared toward businesses and is designed to increase employee engagement, helping participants apply the principles in everyday life. Lodestar empowers people to live a life of character, enabling them to serve and lead effectively and improve interactions at work and at home. Structured with businesses and organizations in mind, Lodestar provides the tools needed to inspire individuals and enhance cultures. The program promotes personal development at work, at church, at home, and in communities by focusing on core principles such as passion, humility, diligence, motivation, and integrity, among others. Each Lodestar principle has a corresponding video that demonstrates the principle in action. The videos tell a variety of stories ranging from the effect of one simple act of kindness to the loyalty between a K-9 officer and his police dog. The loyalty video went viral after a special public release on Lodestar’s Facebook page, garnering attention and praise from across the country. The program’s emotional video content reinforces the transformative power of the 48 character principles. Wingfield shares a faith-based perspective at the end of every Lodestar video. The Lodestar principles also feature online teachings and assessments as well as printed bulletins and faith inserts, creating a robust roadmap for developing the 48 character principles. 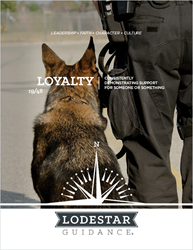 Visit Lodestar-Guidance.com to learn more and to see a demo of the Lodestar Guidance program, and watch the Loyalty video at Facebook.com/LodestarPrinciples. About Lodestar Guidance: Lodestar Guidance is a comprehensive leadership program that facilitates life-changing transformations in leadership, faith, character, and culture. Structured as a series of 48 character principles, Lodestar equips your team with the tools needed to inspire positive change and enhance the culture of your organization. Learn more at http://www.LodestarGuidance.com and http://www.Facebook.com/LodestarPrinciples.